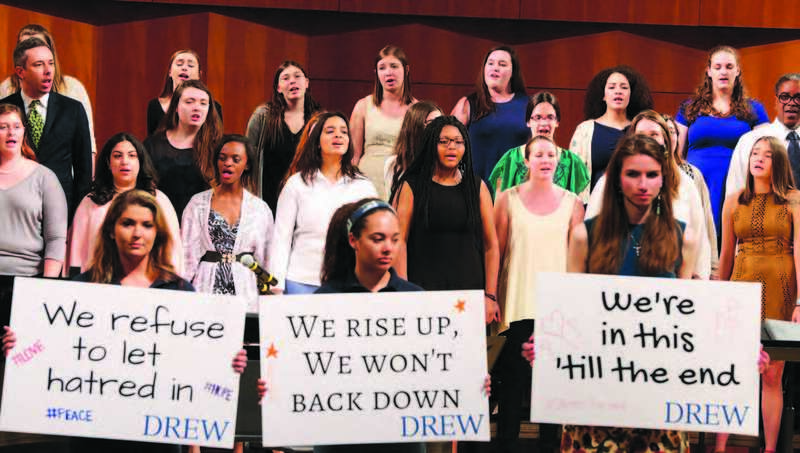 "As its mission statement boldly proclaims, Drew University seeks to educate and cultivate leaders who “add to the world’s good.” This issue of Drew Magazine proves that this goal is neither an empty cliché nor a rarely achieved aspiration. Making the world a healthier, more just and more peaceful place happens to be something that Drewids are particularly adept at—and have been for the past 150 years." President Baenninger celebrating with the Class of 2017, the latest cohort of Drew Gooders. But what, exactly, do we mean when we say that we prepare students to “add to the world’s good”? It obviously means different things in different contexts, but the basic idea is this: All of the communities to which we belong—local, national and global—are, on some level, in need of repair or renewal. They face challenges that keep them from fully meeting the needs of those who live in them or otherwise hinder them from fully achieving their various purposes. Consequently, these communities need bright, thoughtful and imaginative individuals who are equipped to diagnose their shortcomings, devise and implement remedies for those deficiencies or weaknesses, and make them better places in which to live and work. Enter a Drew education, with its historic emphasis on applying what is learned in the classroom to the world beyond our campus—and on bringing that world (and all of its problems, challenges and possibilities) back into our classrooms. This commitment to real-world learning is one of Drew’s indisputable hallmarks, distinguishing it from other colleges and universities. It has also long served as the animating force behind the many programs and initiatives that enable our students to play an effective, intentional and coordinated role in solving the problems of our neighbors. The list of these programs and initiatives is extensive. They range from AdvantageArts and Drew Summer College to the Honduras Project, the Partnership for Religion and Education in Prisons (PREP) and alternative spring breaks. Through these and other programs, Drew students have raised money to purchase medical supplies for people in need in Honduras and the Dominican Republic, taught literacy classes, forged new theological learning communities with persons incarcerated in New Jersey prisons, helped to rebuild New Orleans in the aftermath of Hurricane Katrina, and inspired disadvantaged young people from nearby urban areas to set their sights on both finishing high school and pursuing a college education. 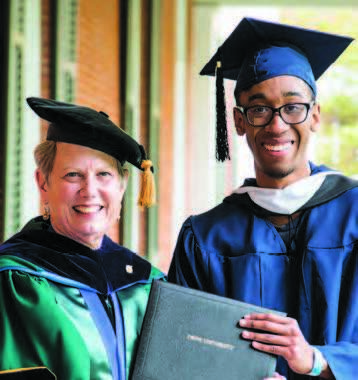 “The Beloved Community” was the theme of Drew’s 2017 baccalaureate service, a reflection of Drew’s mission to make the world a healthier, more just and more peaceful place. Buttressing these programs are a growing number of community-based learning courses offered by faculty from all three schools and organized by the Center for Civic Engagement, as well as an abundance of internship and volunteer opportunities. Drew’s rich heritage of engaged learning and its equally longstanding tradition of volunteerism have made our students—and our alumni—a ubiquitous presence in local politics, soup kitchens, food pantries, crisis and health care centers, afterschool programs and other civic organizations. The array of experiences available to our students goes far toward explaining why Drew seems to be overrepresented in the nonprofit sector—and why so many Drew alumni have become recognized leaders in solving some of the most urgent challenges of our time. In this edition of Drew Magazine, we highlight several of these Drew Gooders and their myriad achievements in contributing to a healthy civil society, both at home and abroad. We also take a look at one of our newest Semesters in New York City—the Semester on Social Entrepreneurship. This interdisciplinary program aims to prepare Drew students to be effective and innovative social entrepreneurs and nonprofit leaders. Through seminars, workshops and meetings with Drew alumni working in the field, those enrolled in this course have the opportunity to build their knowledge of the so-called third sector, the crucial role it plays in American society and around the world, and the issues and challenges it faces, as well as begin to acquire the skills and aptitudes needed to succeed as a social entrepreneur.